Home » Prior vs. Previous – What’s the Difference? When two words are synonyms, how do you choose which one to use? Very rarely are two words completely interchangeable, but in those circumstances, your best bet is to consider the overall fluidity of your sentence. In some cases, one word might seem more natural than the other in context, while its counterpart might stick out. Is there a real difference between the words prior and previous? Continue reading to find out. 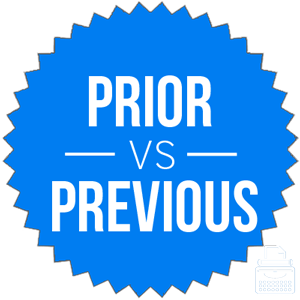 What is the Difference Between Prior and Previous? In this post, I will compare prior vs. previous. I will use each of these words in several example sentences, to give you an idea of how they should appear in context. Plus, I will show you a helpful memory trick that you can use as a reminder of whether to use prior or previous. What does previous mean? Previous is a synonym of earlier. It is an adjective. One might discuss something that happened the previous day, for instance, or the previous week or month or year. Previous comes from the Latin word praevius, and its English form was first recorded in 1621. The quarterback did not rush for significant yardage with his previous team, but has carried the ball much more frequently in the new offense. Many television shows, especially long-running, story-heavy dramas like HBO’s Game of Thrones and AMC’s Breaking Bad, open with a montage reminding viewers of the events of previous episodes. Previously is the related adverb, and it is sometimes a synonym of before, meaning at an earlier time. What does prior mean? The adjective prior is also a synonym of earlier. According to most sources, prior and previous are interchangeable. Indeed, one could substitute prior for previous in the example sentences above without changing their meanings. Prior, though, doesn’t have a related adverb. Some writers use the construction prior to as a synonym for before, but most language authorities scoff at its use. As Bryan Garner (2016) notes, you wouldn’t use posterior to instead of after, so you probably shouldn’t use prior to instead of before, either. Prior also comes from Latin, where it is related to the same root as previous. Merriam Webster actually records its first use in 1607, a few years earlier than previous. This is one of the rare examples of two words that really are interchangeable. You could use both prior and previous as synonyms of earlier, where they become adjectives. Previous is used a little more frequently, though, at least since 1800. If one of your goals is to make your writing as accessible as possible to a majority of readers, previous might be a better bet since it is more common. Since previous and frequently both contain the letter E, you can easily remember that previous shows up more frequently that prior in published English. In reality, though, you should probably just choose whichever word fits best in the context of your sentence. Is it previous or prior? Prior and previous are two interchangeable adjectives that mean earlier. Previous is slightly more common, but either word will work in any context. 1 What is the Difference Between Prior and Previous? Opaque vs. Translucent – What’s the Difference?